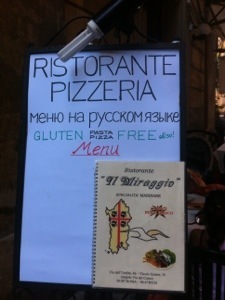 I have an amazing tale of gluten-free excellence to pass on from Rome. I spent the entire Mediterranean season hearing about how delicious all the pizza and pasta in Italy was, and never getting to try any, as that is generally a giant pile of gluteny death for me. On our last Rome stop, my Russian friend Alexey and I were walking to the Trevi fountain and happened to turn down a fabulous side street that had a small sign advertising….wait for it….RUSSIAN MENU AND GLUTEN FREE MENU. We both almost had heart attacks. For one, Alexey could read the menu in his mother tongue and I could order something traditionally Italian. We scurried off to the Trevi fountain, after promising the lovely Maitre’d that we would most certainly be returning. A few coin tosses and some priceless photo stops later, we returned to the restaurant, and the waiter proudly informed me that EVERY PIZZA AND PASTA on their menu could indeed be made completely gluten free! After I recovered from the shock and amazement, of course I ordered a pizza, Alexey happily read his Russian menu, and we shared some crisp Sicilian pinot grigio. 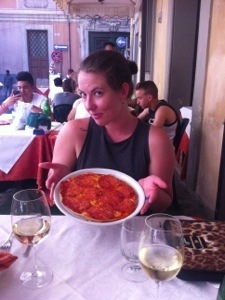 Let me tell you right now, that was hands down the most amazing pizza I’ve ever eaten, on my last day in Rome, I finally got to experience what my friends had been going on about. It was an absolutely unforgettable day in Rome!